ARTISTIC LOG CABIN, private and peaceful. Set into a perfect homestead property with fruit trees, berries, gardens and naturally terraced terrain. With woods and old pastures all around, the birds will herald the morning sunrise. Beautiful views from the numerous windows and porch around two sides of house; also, a large slate patio that is perfect for cook outs. Fully appointed kitchen with dishwasher, microwave and two ovens. Cabin accomodates up to 8 people, master bedroom with private bathroom, second bedroom has one double bed, one single and another single in bedroom loft (which kids LOVE). The third bedroom has one double bed. The fourth bedroom has one double and one single bed. The sunroom has two couches that double as beds. The bedrooms and two bathrooms are upstairs, one bathroom is on the first floor. The cabin is owner built from mostly reused or local materials found in surrounding woods. Each bathroom is a unique work of art and you have never seen a fireplace like this one! The cabin is meant to be an example of how a beautiful, comfortable and functional house can be built for a fraction of the cost using your imagination. $180 per night, 2 night minimum based on up to 4 guests, additional guest $35 each per night. ALSO AVAILABLE: Two story treehouse. sleeps 5, very cool! type in 802728 in the "search for" bar to find it on this site. I am a stone mason/carpenter/artist that believes in living simply and close to nature. I enjoy creating spaces for people to use and demonstrating that living spaces can be beautiful, efficient comfortable and economical to build if you use your imagination and local resources. I think a building can have a life of it's own and impart a feeling on the people that stay there. I stive to create exotic, beautiful and organic structures that resonate tranquillity and harmony with their surroundings...... I hope you will agree. 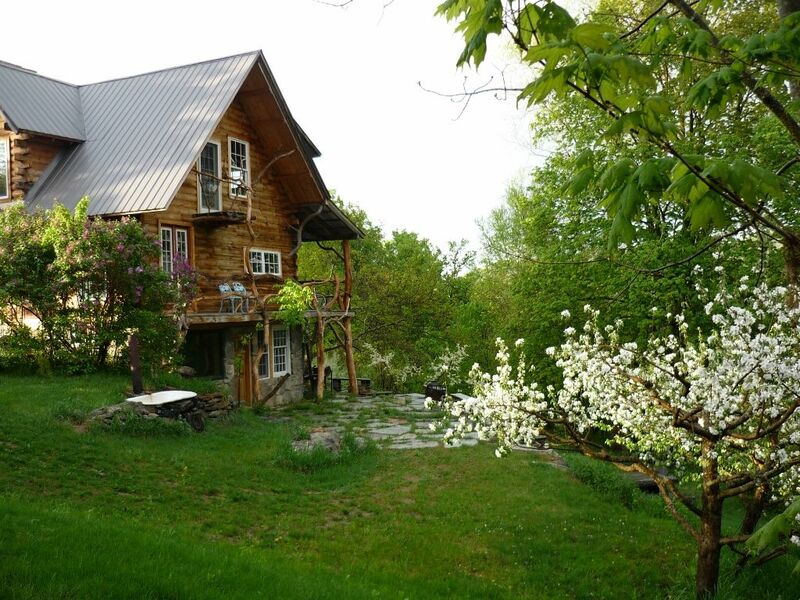 This property has every thing that I was looking for in a piece of land: various levels, a view, open land and wooded, some huge old tree and stone walls that give it a feeling of history, water nearby and a rural feeling, and of course- being in Vermont, a state I feel a great connection with. The benefits of this property are that it is centrally located, as I have said, 'all roads lead to West Pawlet.....eventually'. It is also private yet easy to access. Each bathroom is more unique than the last, all very cool, imaginative and functional. Farms all around, fields, woods and old style country farm houses and barns, people are friendly and the pace is slower. 1 mile away is a farm/cafe where they make world famous goat and cow cheese. Private location with views of surrounding hillsides, and Green mountains. In evening as sun lowers you understand where the words 'purple mountains' majesty' comes from. In summer, lots of green. The most amazing fireplace you will come across. Some wood and kindling provided, more available to purchase in town or from host. Tables can be attached in a way to seat many or left separate for more intimate groupings. small stereo ipod player and small CD player in kitchen. small Romeo and Juliet balcony off of master bedroom. Balcony overlooking slate patio. Kayak/Caneo rentals at the Battenkill river which is 35 mins away. Three 18 hole courses, one 15 mins away, two 25 mins away. Mini golf 20 mins away. Only outside of house. On the porch is fine. A business buddy and I were up there for a mini retreat and we absolutely loved it. The owner, Rik, was very accommodating and extremely friendly. Ask about his Hobbit house and get ready to be mind blowned. Loved the house and property. Very relaxing and soothing environment!! We came to this house for a couple of days just wanting to get away from the city and commotion of things. The house was very unique. We loved every room, especially the bathrooms! Wonderful experience, definitely would go back. My family and I stayed at Riks cabin for the weekend and it was incredible. The detail and art that Rik put into this cabin are beautiful. The cabin is large with 4 bedrooms and 4 bathrooms. My family of 7 adults, 2 children, and 3 dogs all fit perfectly and comfortable in the cabin. The bathrooms were works of art and just showering in these custom bathrooms was a great experience. Outside we followed the road up to the hill to find some of Riks other projects, treehouses, etc. Also, Riks rosemary bread was outstanding and his eco-friendly way of life is inspiring. We all had a great time and created beautiful memories. Thanks for having us! Rik is a gracious host and an interesting man, and we enjoyed meeting and chatting with him when we arrived. The cabin is truly special. The extraordinary craftsmanship and attention to detail throughout make it clear that building it was a labor of love. To say that it is "artistic" feels like an understatement. This is a home that surprises, delights, and provokes thought, as you would expect from a great work of architecture, and would not necessarily expect in a log cabin. It is also very comfortable and well-thought-out. With all of its artistic merit, it has not lost the warm and cozy feeling you hope for in a log cabin. The location is good, too: it's far enough away from the larger towns like Manchester that it's very quiet, with almost no light pollution (the sky is breathtaking on a clear night). But it's also close enough to dining, shopping, skiing, etc., so as to be convenient. There are some things to be aware of, depending on your expectations and needs: 1. There is almost no cell signal, so don't count on making or receiving calls at the cabin. 2. The wifi doesn't work well with all devices (e.g., worked with my wife's Kindle Fire, but not with my MacBook), so if you're planning on a working vacation, it may be a challenge. 3. The door has no lock, so if you are very security conscious and/or prone to worry, you may find this unsettling. None of these things hindered our enjoyment of this wonderful cabin, though. We loved every minute of it, and would happily stay there again. Just the two of us spending time together in a snowy wonderland. The house was cozy and we loved the opportunity to experience a bit of Rik’s splendid imagination when it comes to architecture and lyrical design. We highly highly recommend this house and its generous host. This is a four season location, centrally located between five ski areas (two large, Stratton and Killington and three smaller ones, West Mountain, Bromely and Willard Mountain). There is cross country skiing and snow shoeing nearby. In the warmer months, there is trail hiking at Merck Forest Farm Center (along with various homsteading demonstrations and workshops on different weekends). There are a few mountains to hike nearby for views of surrounding towns and area (1 to 2 hour hikes). Many biking opportunities around, including a tandem bike here that is at your disposal. There is a 30 mile converted rail trail at the bottom of the driveway for biking, walking, horsebackriding and snowmobiling. Fishing on the Famous Mettowee and Battenkill rivers (canoeing/tubing as well). Dive into history and swim at the Old Dorset Marble Quarry, there is also a playhouse and an 18 hole golf course/tennis, along with fine dining in Historic Dorset (15 mins away), Saratoga is an hour away with Racetrack/Casino, shopping, dining, music and arts. Water slide, tree-top adventure course and zip line at two ski resorts in summer. Beautiful Lake St. Catherine (15 mins away), Lake Bomoseen (35 mins away) and big Lake George (45 mins away) all have boating, water skiing while Lake George has golf, mini golf, dining, malls, and Great Escape amusement park/ water park. Locally there are numerous farmers markets, yard sales, and antiquing options around. Natural Vermont provides streams to peruse, birds to watch, hunting in hunting season and mid Sept. to mid Oct. is foliage season when the hills burst into oranges, reds and yellows. Sightseeing all around, but if all this activity seems too much and what is really needed is a break from activity, then grab a cold drink and relax on the porch swing or hammock and enjoy the sunset while listening to the great horned owls, then come inside for a nice romantic evening in front of the fire.